Former Darren Weir trained mare Whispering Brook could sneak into the field for the $5m All-Star Mile (1600m) with a good performance in today’s Group 1 $500,000 Ladbrokes C.F. Orr Stakes (1400m) at Caulfield. Whispering Brook, above, is one of the main fancies for the 2019 C.F. Orr Stales at Caulfield. Photo by Ultimate Racing Photos. Whispering Brook was transferred back to her original trainer, Perth based Simon Miller, following the disqualification of Weir this week, and the Ascot trainer said that a wildcard entry into the All-Star Mile at Flemington on March 16 would be a great result. “I’ll look at the Newmarket but if she won she’d have to come into contention for an All-Star Mile wildcard,” Miller told the Herald Sun. Miller looked after Whispering Brook in the early part of her career and ventured to Melbourne during the 2016 Spring Carnival with the then three year old filly to run third behind Global Glamour and I Am A Star in the Group 1 $500,000 Schweppes Thousand Guineas (1600m) at Caulfield. Whispering Brook has been under the care of Caulfield trainer Gemma Reilly, a former apprentice of Miller’s, and the reports coming out of the stable is that the five year old mare has come through her win in the Group 2 $200,000 Australia Stakes (1200m) at The Valley on January 25 in great shape. “Gemma couldn’t be happier with her,” Miller said. Australia Stakes winning jockey Mark Zahra takes the mount again on Whispering Brook who will jump from barrier seven in the C.F. Orr Stakes field that has been reduced to fourteen runners following the scratchings of Fell Swoop and Mask Of Time. 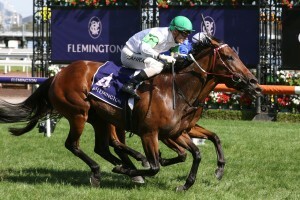 Whispering Brook is on the third line of betting at $7 with Ladbrokes.com.au for the C.F. Orr Stakes behind the James Cummings trained Kementari at $3.20 and Ciaron Maher and David Eustace’s new stable acquisition Land Of Plenty at $6. The post 2019 C.F. Orr Stakes fancy Whispering Brook looking to sneak into All-Star Mile appeared first on HorseRacing.com.au.